A side opening gents boxer short designed for ease of dressing. The boxers also make a great garment for gents with leg fixator devices, as a substitute for conventional briefs or as a pyjama bottom. 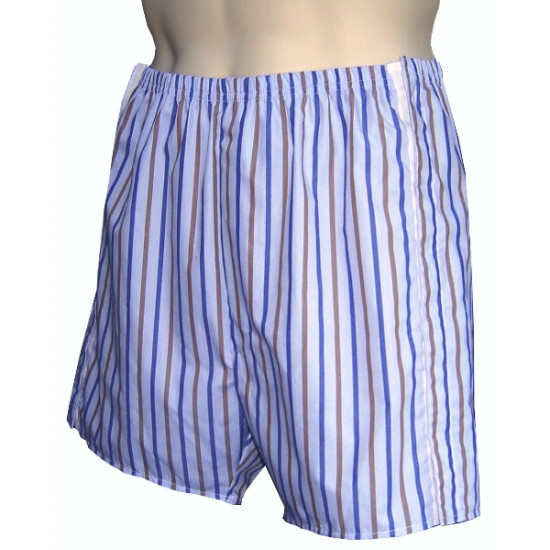 These side opening boxers have also been designed for those who prefer a roomier fitting boxer short in a woven fabrication. Made from 100% Soft Woven Cotton. Popper tape with robust metal poppers has been used to secure the side seams. The Side Opening Boxer shorts have a functional fly opening. Elasticated waist, with the back rise being slightly deeper than conventional boxer shorts making them particularly suitable for wheelchair users. Fabric swatches are available so please give us a call for our latest designs. Please note current coloured is different to the illustrations shown on the website.